Last Tuesday, Raptor baby sat on the lap of an attempted murderer. I took the matter lightly as everyone gathered around my dining room table was actively scheming to become a full-fledged killer. My pile of preselected titles for a girls' night out game night, went ignored after Kill Dr. Lucky entered the conversation. Our friend mentioned how much her children* enjoyed the game, and soon I was pulling out our color edition of the game (Titanic Games, 2006). Like Clue, game players are wandering around a remote mansion. Unlike Clue, everyone wants to kill the mansion's owner, Dr. Lucky. Players search the house for weapons and work to get Dr. Lucky alone in a deserted area. When an attempt is made on Dr. Lucky, other players work to foil the attack (so they can kill Dr. Lucky and win the game). The weapons range from the delightfully ludicrous (tight hat, bad cream, civil war cannon) to ones filled with literary allusion (monkey's paw, trowel). Our party of six spent over an hour alternately making attempts on and rescuing Dr. Lucky. The experience reunited me with an old favorite, and introduced friends to a new one. Because of some smart rule changes (every player gets to play at least one turn and the addition of spite tokens) the updated Titanic Games version ($34.95) exceeded my memories of the original by Cheapass games ($7.50, paper board and cards; pawns not included). Sadly, Kill Dr. Lucky appears to be out of print in both editions. UPDATE: Kill Dr. Lucky is no longer out of print. 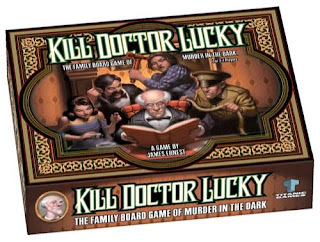 You can pick up a copy of the new version of the deluxe Kill Doctor Lucky for around $26 from Amazon.com. While the basic game mechanics can be mastered by kids in elementary school, the objective (murder) might not be right for every household. *The word b*st*rd appears in the instructions; my friend just substitutes in another word when playing with her kids if she even bothers reading the rules aloud. Some of the humor is insulting. One of the failure cards simply reads "You're stupid, stupid, stupid!" Although this totally cracks me up among adults, I don't really want to hear it from Ranger any time soon. Our recommendation would be Tween - Adult. Play time: varies, Board Game Geek says 45 minutes for the Titanic edition. It definitely takes longer with first time players and with larger groups. We would not try and cram a 6 player game into a 60 minute lunch hour. The CAG version takes longer, especially with large groups. Jim recalls one 3 hour game without a spite token rule variation. The game board is a mansion with numbered room and non-numbered halls and stairways. The card deck consists of failure cards, room cards, move cards, and weapon cards. All players are dealt 6 cards and begin in the drawing room at the center of the mansion. During a turn the player has 1 free move. The player can also play room or movement cards to move themselves or Dr. Lucky, and/or if the conditions are right make an attempt on Dr. Lucky's life. If a player does not play a card during his turn, he is allowed to draw a card. This option to snoop allows players to gain weapons, failure points, or additional means of movement. When a player is able to corner Dr. Lucky in an area that other players cannot view, she can opt to whack the old fellow. Without weapons, an attack is worth 1 point. Weapons make the attack more effective by a variable number of points. Some weapons have greater value in specific room (like the trowel is more effective in the Wine Cellar, a la Poe). After an attack is launched, each other player has the opportunity to play failure cards in order to save Dr. Lucky (temporarily). The player attempting murder might find herself attacked by bats, overwhelmed with empathy, or simply distracted by a catchy tune. Take the time to read the failure cards aloud during play; you won't regret it. If you're playing with spite tokens, the attempted murderer receives a token for the experience. These tokens add an extra point to attacks (and retained) or can be used as a failure point (and given to the attacker). At the end of each turn, Dr. Lucky moves to the next room in numerical order. When an attack is not foiled by other players, a victor is declared. Expect demands for a rematch. ***Baby Toolkit is a set of actually nice geek parents. We're only murderous in the context of this great game. Besides, the old coot deserves it and a killing joke is gonna be the way we do it We have no financial relationship, other than being customers, with Titanic Games or Cheapass games. We are, however, Amazon affiliates, so a portion of purchases made through our links goes toward our dreams of a bigger game collection. I love this game! It is probably one of my favorite games from Cheap ***. Of course I have several favorites from them, so it'd be hard to narrow it down. I can't wait to see some of your other favorites. A thread on Board Game Geek says that Titanic Games is planning to reprint the game later this year. It looks like they have run out of their last printing. This is a very popular game, so keep an eye out for it. Why is it that the good games always seem to be out of print? Great review - I love your idea to write these game reviews and look forward to hearing about other games you have enjoyed. Have you ever played or heard of "The Really Nasty Horse Racing Game"? It is a total blast and one you might enjoy if you lean towards the quirky. Cheapass does make some great games (and some less great games...) My personal favorite is Lord of the Fries, also avaliable as a delux color game. 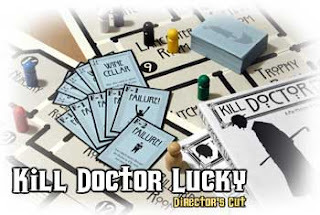 As noted in the update of the post, Titanic Games now has a reprint of Kill Dr. Lucky.